Home » Ford Explorer » What’s Under the Hood of the All-New 2020 Ford Explorer Lineup at Brandon Ford in Tampa FL? The all-new 2020 Ford Explorer lineup was only recently unveiled, which means we don’t know a lot about it yet. But what we do know about it has us so excited that we need to tell you all we know. And out of everything we do know – from the 2020 Explorer lineup’s new trim levels to its complete interior and exterior redesign – it’s what’s under the hood that has us the most excited. With that in mind, let’s take a closer look at what’s under the hood of the 2020 Ford Explorer lineup by checking out its engine options and new powertrain features. What Engines are Available for the Returning 2020 Ford Explorer Trim Levels at Brandon Ford in Tampa FL? 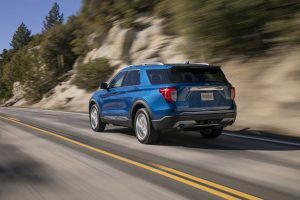 As we briefly pointed out in our introduction, the new Ford Explorer lineup at Brandon Ford in Tampa, FL, features two all-new 2020 Explorer trim levels that themselves feature two all-new powertrains. We’ll get to those in a minute, but let’s first check out the engine options for the returning Explorer trim levels. Most 2020 Ford Explorer trim levels will be powered by a standard 2.3-liter turbocharged inline 4-cylinder engine featuring 300 horsepower and 310 pound-feet of torque. The 2020 Explorer Platinum trim level will be powered by a standard twin-turbocharged V6 engine, though we don’t know the power ratings for this engine at this time. What Engines are Available for the New Trim Levels of the 2020 Ford Explorer Lineup at Brandon Ford in Tampa FL? That brings us to the two all-new 2020 Ford Explorer trim levels – the 2020 Explorer Hybrid and the 2020 Explorer ST. The 2020 Ford Explorer Hybrid is powered by a standard 3.3-liter hybrid powertrain featuring a combined 318 horsepower and a total driving range of over 500 miles. The 2020 Ford Explorer ST is powered by a standard 3.0-liter EcoBoost engine featuring 400 horsepower and 415 pound-feet of torque. If you’d like to learn more about the 2020 Ford Explorer lineup or any of our other new Ford cars, trucks and SUVs, please contact our staff here at Brandon Ford in Tampa, FL. How Powerful and Capable is the 2019 Ford Explorer Lineup at Brandon Ford in Tampa FL? How Powerful and Fuel Efficient is the New Ford Explorer at Brandon Ford in Tampa FL? This entry was posted on Wednesday, January 16th, 2019 at 8:08 pm	and is filed under Ford Explorer, Powertrain. You can follow any responses to this entry through the RSS 2.0 feed. Both comments and pings are currently closed.